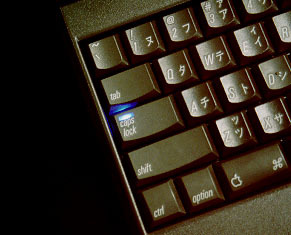 LED of Power Book Duo's caps lock key is easily changed to favorite color. 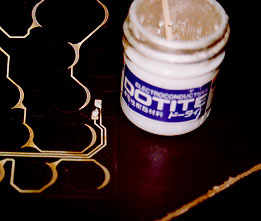 It is only to substitute to new LED using conductivity glue. I will show how to change. It is needed only torx driver and conductivity glue. Let's try ! Put out keyboard from Duo, and remove all key tops. Remove LED at caps lock by fingertips. Printed wiring is also removed. Threfore restoration removed patterns and terminal by conductivity glue. I used DOTITE (Fujikura, Japan). It is used for scanning electric microscope sample. It was put by spit. Put tip type LED on terminals. I used blue tip type LED. LED has polarity, therefore turn marked side to shift key. After finishing, check connection of terminals by seeing from reverse side. Assemble all parts and boot Duo. If LED did not radiation, check glueing or conduction. Otherwise, terminal may short circuit.